A poll worker checks the identification of a resident at a polling location during the Wisconsin presidential primary on April 5. As the presidential election nears, a number of important voting law cases are still up in the air. And that can be confusing — for voters trying to figure out what they do or don't need to cast their ballots, for election officials trying to figure out how to run elections, and for politicians trying to make sure supporters get out and vote. Here's a brief guide on where some of the big cases stand, as of the end of June. More rulings are expected, although courts are reluctant to make major voting law changes too close to Election Day. The state made sweeping voting law changes in 2013, right after the Supreme Court struck down a provision of the Voting Rights Act that might have prevented the law from taking effect. The U.S. Justice Department, the state NAACP and other advocacy groups have been fighting the changes ever since. They say the law discriminates against minorities and is unconstitutional. Among other things, it requires voters to show a photo ID, unless they swear they faced a "reasonable impediment" trying to get one. It also eliminates the ability to register and vote on the same day, cuts a week of early voting and prohibits ballots cast in the wrong precinct from being counted. A federal appeals court panel heard arguments in the case June 21, after a lower court upheld the law. A ruling is expected soon, but the losing side will almost certainly ask the full Fourth Circuit Court of Appeals or the Supreme Court to weigh in. Here's another major case that could end up before the Supreme Court before too long. In April, the high court effectively gave the 5th Circuit Court of Appeals until July 20 to rule on a long-running challenge to the state's photo ID law, or else the high court said it would step in. Right now, Texas voters need to show one of seven forms of ID — such as a driver's license, passport or gun license — to cast a ballot. The law was struck down in 2014 by a federal judge, who found that it discriminated against minorities. 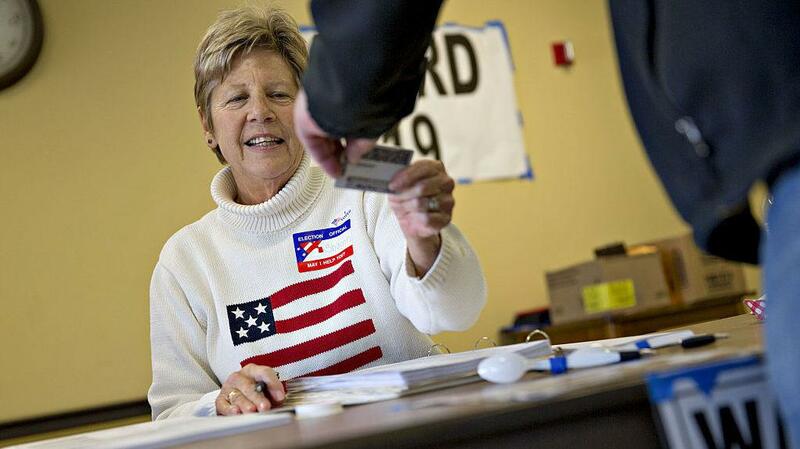 She noted that an estimated 600,000 voters in the state don't have the right kind of photo ID. But a federal appeals court panel blocked her order, and the Supreme Court agreed, saying it was too close to the 2014 election to change the rules. But last year, a three-judge panel on the 5th Circuit appeals court also found the law discriminatory. The state appealed to the full appeals court, which has yet to rule. It's no surprise that the swing state of Ohio has a number of voting law cases working their way through the courts. In May, a federal judge ruled that the state's elimination of a week of early voting — when voters can also register to vote — was unconstitutional because it disproportionately hurt minority voters who are more likely to use that option. Then, in early June, another federal judge ruled that laws governing how absentee and provisional ballots are counted were also unconstitutional and violated the Voting Rights Act. Those laws prevent the counting of ballots from legitimate voters who make minor mistakes, such as entering the wrong date or forgetting to include a zip code in their address. Both cases are being appealed by the state, which says the rulings are confusing for voters and will cause "chaos." Numerous attempts to overturn the state's photo ID requirement seemed to hit a dead end last year when the U.S. Supreme Court refused to take up the case. As a result, voters in the state had to show an ID in this year's presidential primary. But opponents of the law are now trying to get a federal court to agree that there should be exceptions for voters who face a "reasonable impediment" to getting an ID, similar to what's included in the North Carolina law. The suits are now in federal court. Whatever the outcomes, the losing side will almost certainly appeal. This is one of those cases with so many twists and turns, it's hard to keep up. But it's important because the outcome could determine whether other states follow suit. Since 2013, Kansas has required residents to show proof-of-citizenship when they register to vote. But a number of courts have blocked that requirement when it comes to federal elections — for president or members of Congress. In response, the state set up a two-tiered system where those who don't show proof-of-citizenship can vote in federal elections, but not state or local ones. But that arrangement was struck down earlier this year by a state judge, for those who used a national voter registration form. Still following? There's more. In May, a federal judge ordered the state to start registering approximately 18,000 voters whose registrations had been held in suspension because they didn't show proof of citizenship. Kansas Secretary of State Kris Kobach has appealed. He argues that the law is needed to stop immigrants in the country illegally from voting. For now, Kobach has ordered that the suspended voters be registered, but only for federal races. Meanwhile, a federal judge on Wednesday refused to block a move by the director of the U.S. Election Assistance Commission allowing Kansas and two other states to require proof of citizenship for voters using a federal registration form. More legal action is expected. This case is in state court, so it won't have the same national legal implications as some of the other cases. But it could affect the outcome of the presidential race. The state's Democratic Gov. Terry McAuliffe issued an executive order in April restoring voting rights to more than 200,000 ex-offenders. Virginia Republicans were furious, arguing that the governor had overreached his authority, and that such rights can only be restored on a case-by-case basis. They accused the governor of trying to boost the prospects of Democratic presidential candidate Hillary Clinton, under the assumption that many ex-offenders are minorities, who tend to vote Democratic. McAuliffe insists he was just trying to help ex-offenders reintegrate into society. The state Supreme Court is schedule to hear the case July 19. About 7,500 ex-felons have been registered to vote since the order was issued. There are many other cases working their way through the courts, including one claiming that Arizona's lack of sufficient polling sites in the March primary was discriminatory. But these are the big ones. Ned Foley, an election law expert at Ohio State University, notes that all this legal activity comes after the Supreme Court's decision on the Voting Rights Act, which allowed states to start changing their voting laws without federal approval. Foley says at some point the high court will have to set a standard for determining whether voting laws are discriminatory. Lower court rulings are all over the map right now. But Foley doesn't expect anything definitive this year because of a vacancy on the high court. "With an eight-member court, I can't see them trying to fast track this," he says. That could leave voters facing some inconsistent — and confusing — voting rules in November.